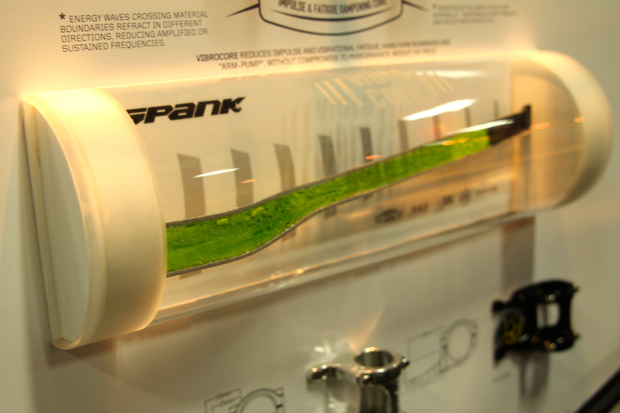 In a sense, Spank’s Vibrocore is somewhat of a “hack.” It is an alloy bar that’s designed to act like carbon, but at a lower price. 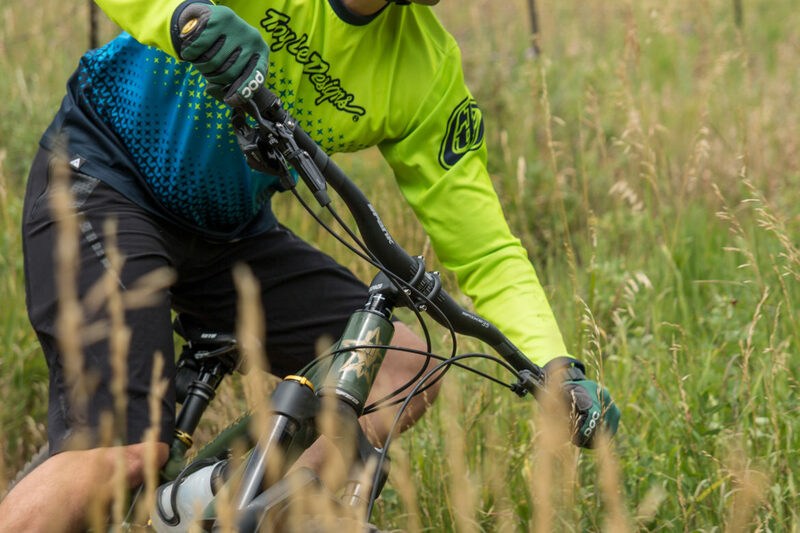 By filling the inside of an alloy handlebar with the Spank proprietary green foam, vibrations are reduced, like a carbon handlebars’ would be, and the riders’ hands are left in less pain at the end of downhill runs than they would be with an alternate bar. The inside of a Spank handlebar with Vibrocore. 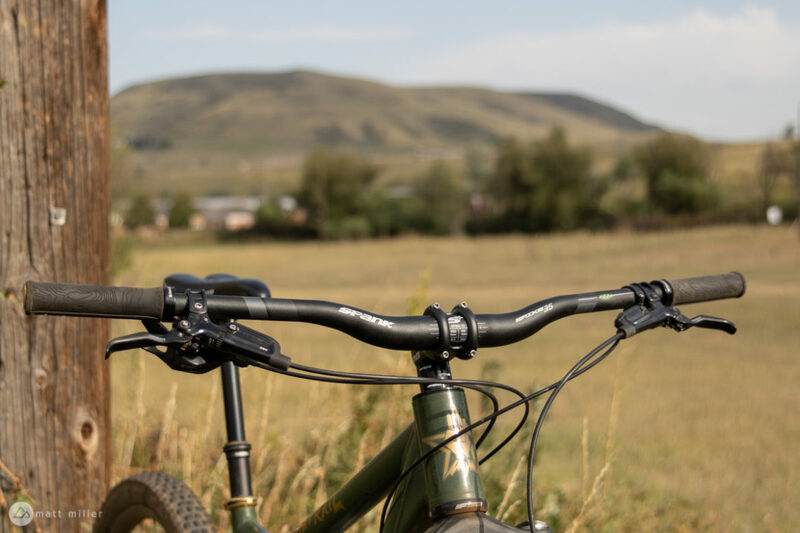 Singletracks has reviewed another set of Spank handlebars with Vibrocore, but that was before Spank offered a 35-millimeter clamp diameter option. Now that Spank has the Spike 35 Vibrocore available, Singletracks gave it another go to see how to foam performs with a bigger bar. 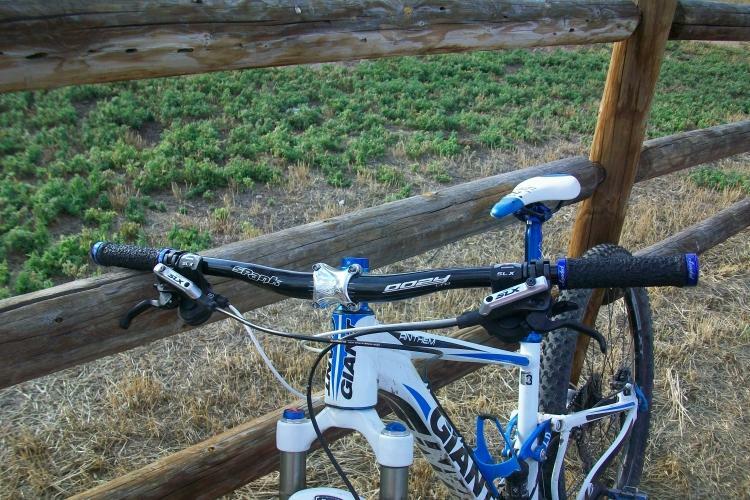 Spank is blunt about the fact that these are not the bars for average trail riding. At 820mm wide, I could’ve figured. They’re meant for downhill, freeride, enduro, or just gravity-oriented riding in general. Currently, my mountain bike is an organized and functional mess of heavy duty, gravity-oriented review parts, so the Spikes fit right in. 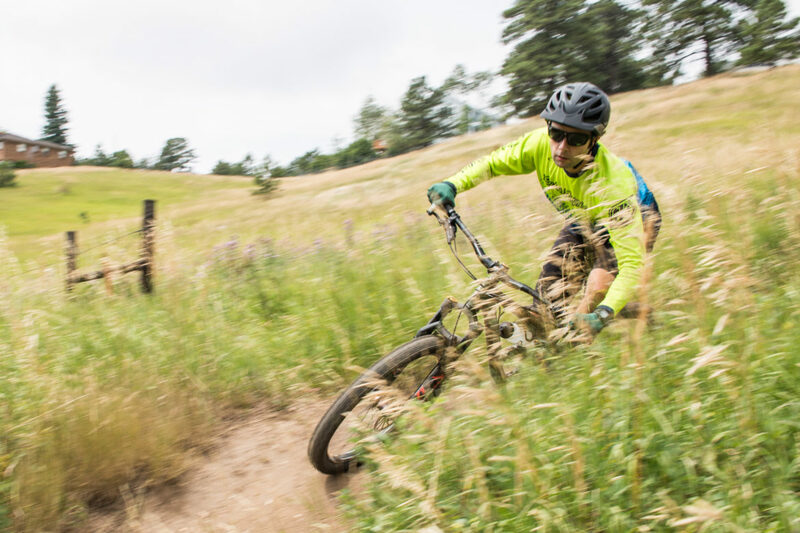 I’ve been riding with the bar on my rugged local trails like White Ranch and Apex, as well as my closest bike park, Trestle at Winter Park. Initially I was a bit worried that the bars would be too wide for me, as they are almost an inch wider than the 800mm-wide bars I usually opt for. As it turns out, I really didn’t mind them. 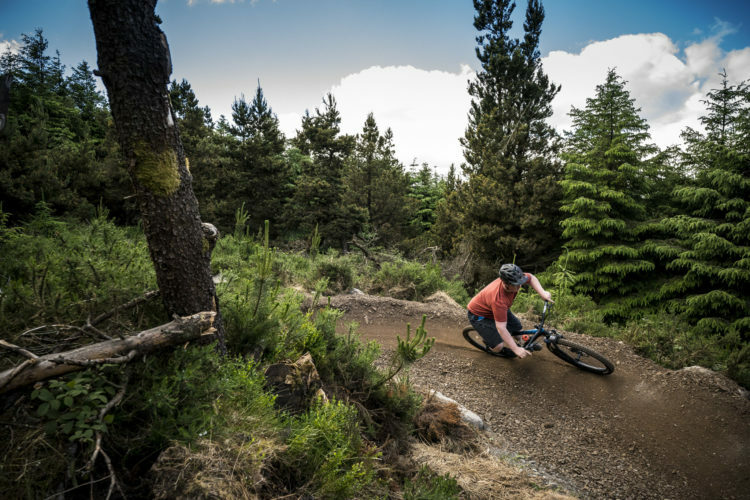 The stability you get from the extra width is noticeable cornering, especially when you want to throw your whole body into it. The width is also nice for a lower center of gravity. 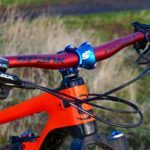 In our previous test of the Spank Oozy Vibrocore 760mm trail bar, we talked about a Spank study that concluded 35mm clamp diameter alloy handlebars offer the least amount of vibration damping, even over 31.8mm clamp diameter alloy handlebars. 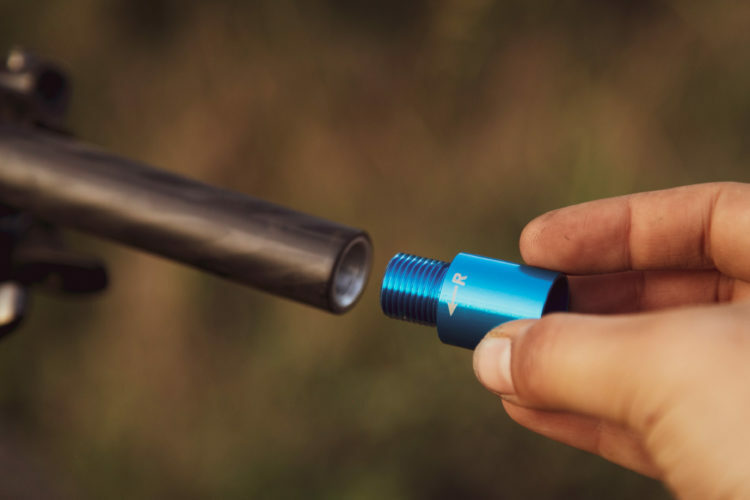 Now that Spank is offering 35mm clamp diameters on the Spike handlebars, it may be an indication that component manufacturers aren’t fighting the new(ish) clamp diameter anymore. Spank says that they’re not eliminating the vibrations, but rather displacing vibrations to a higher, and less damaging frequency. Since I just finished reviewing a set of ENVE carbon handlebars, my hands were just itching to see if they could tell a difference. And, they could. 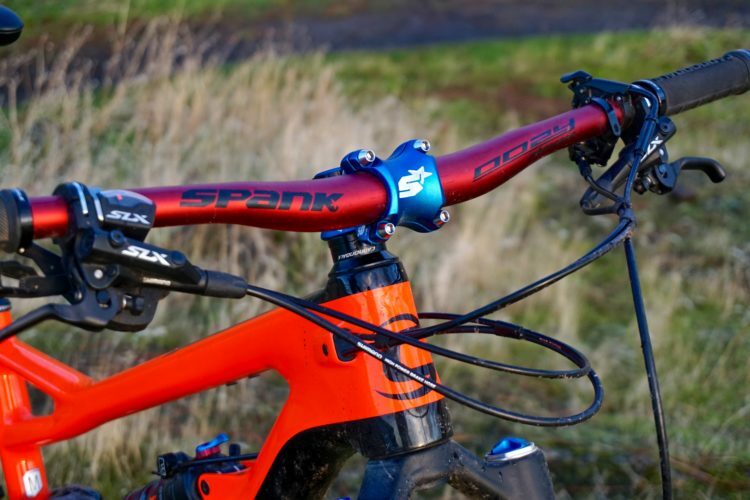 The Spank Spike 35 is noticeably different than a set of regular alloy handlebars and also from carbon handlebars, and in terms of ride feel fit somewhere between the two. 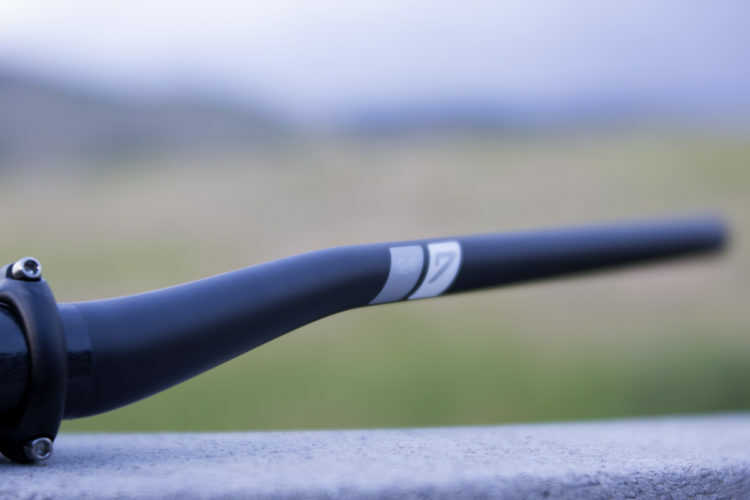 Carbon handlebars offer better vibration damping than the Spikes, but they aren’t too far ahead. The bars weren’t quite as stiff as carbon bars either, and for some, that’s going to be welcome. I found the 820mm-wide Spank Spike bars useful to get extra leverage around corners. Photo by Hannah Morvay. 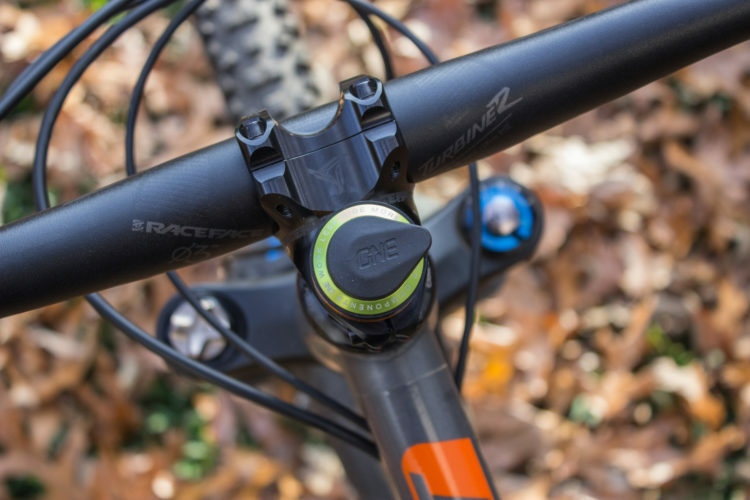 If I had to put a number on the damping performance, I’d say that the Vibrocore handlebars offer about 75% of the vibration damping of a set of carbon handlebars. 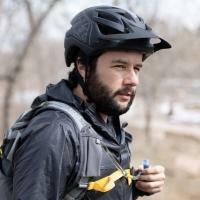 Since the bars are intended for the portion of the mountain bike community that is also the hardest on their components, a set of alloy handlebars probably makes sense over a set of carbon handlebars. 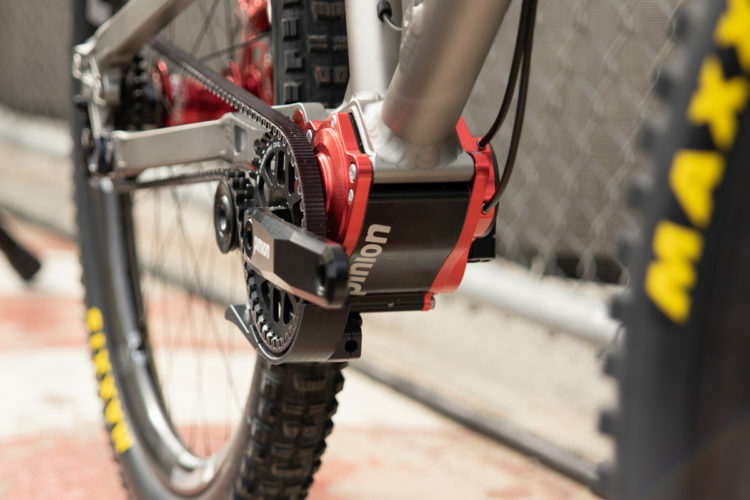 Riders will find an extra sense of security in the Spikes, and save some money over grabbing carbon. 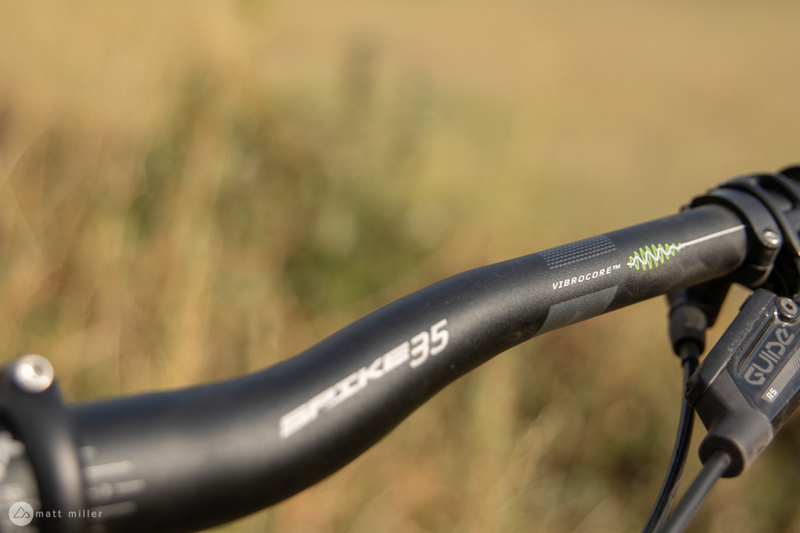 The Spank Spike 35 handlebars are a welcome alternative to carbon handlebars for freeriders and downhillers who want vibration damping characteristics. They’ll also welcome the reasonable price tag of the Spikes. 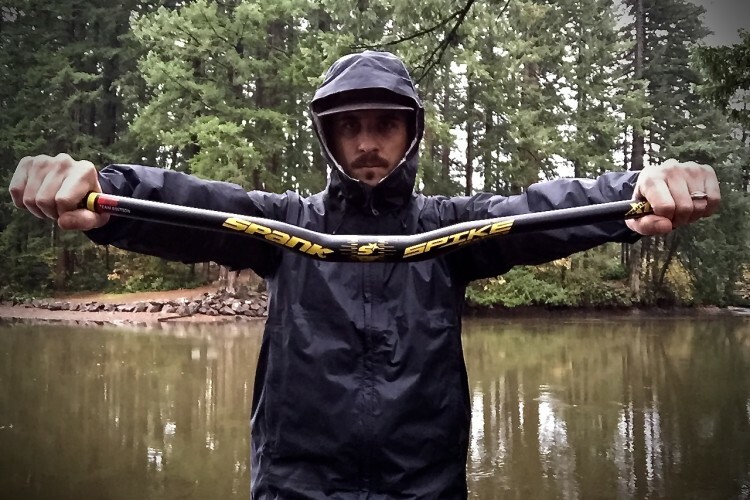 Thanks to Spank for providing the Vibrocore handlebars for review.